Less a case of "you snooze, you lose" than "blink and you missed it." Think of all the things that you could do in 10 minutes: cruise through Facebook and like all of your friends’ posts, eat a chocolate bundt cake, listen to “Careless Whisper” twice. The possibilities are endless. If you’re Mazda and you’ve got 10 minutes to spare, you’re making yourself a cool third of a million dollars. 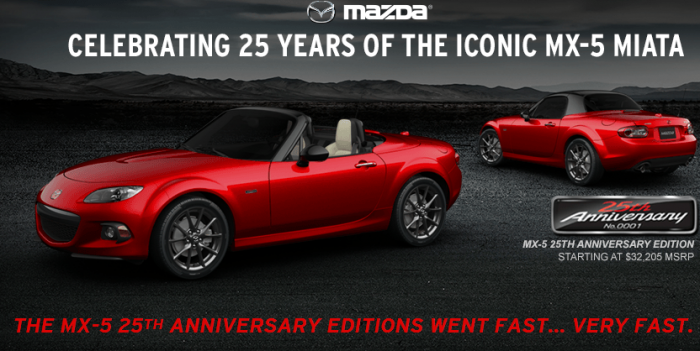 That’s exactly how long it took for Mazda to sell all 100 examples of the 2015 MX-5 Miata 25th Anniversary Edition. The pre-ordering proceedings were set to get underway at 10:25 AM PDT on Tuesday and conclude at 11:25 AM PDT on May 31 (or whenever 250 people registered). 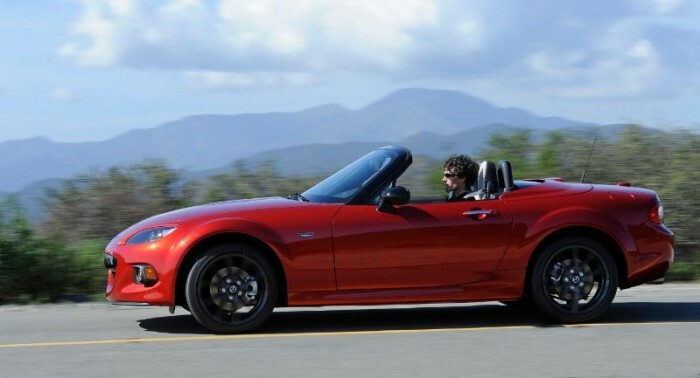 Given the fact that the 25th Anniversary Edition Miata sold out in 10 minutes, one has to wonder why Mazda thought it would take ten days in the first place. So if you were thinking you had time aplenty to get your pre-order in, forget about it. You can still get yourself the standard 2015 MX-5 Miata for when they arrive at dealerships later this summer, which isn’t half bad as far as consolation prizes go. In the mean time, you might want to start thinking about filling out your telepathic user agreement now and getting ready to submit it via MindMail in order to stay ahead of the teeming masses looking to scoop up the 50th Anniversary Edition Miata in 2039.